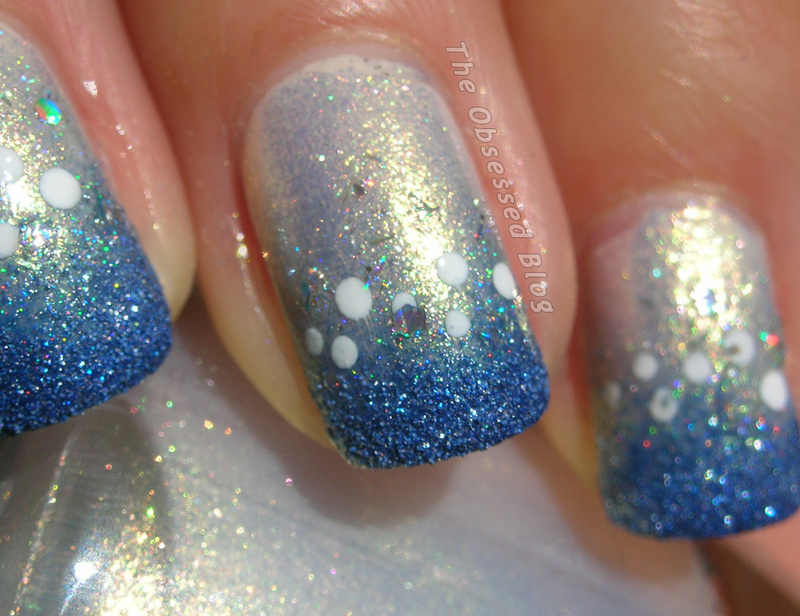 The first week’s nail art challenge is “snow” – and I decided to go for an abstract look. My snow-themed nail art is inspired by the beauty of a sunny, cold day in the middle of winter, when the ground and trees are totally covered by sparkling, fluffy snow. I started with a base colour of OPI’s Ski Slope Sweetie (which I was wearing over a coat of OPI’s My Vampire is Buff already) – this was completely dry. I then sponged on a gradient of Zoya’s gorgeous blue Pixie Dust Sunshine with a hint of a blue-grey holo Colors by Llarowe called Rare Bear in the middle and OPI’s Ski Slope Sweetie toward the base of the nail. Finally, I applied a few dots using Butter LONDON’s gorgeous white Cotton Buds and OPI’s glitter Which is Witch? for sparkling snow. 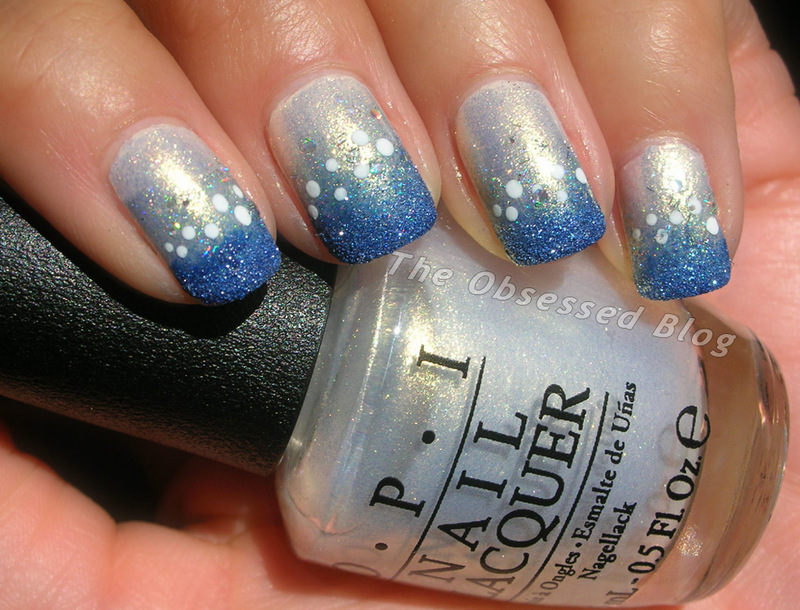 Mariah Carey for OPI’s Ski Slope Sweetie epitomizes a gorgeous, snow-covered ground – it is a beautiful white with golden shimmer, so I thought it would be the perfect base for this “snow-covered” mani. 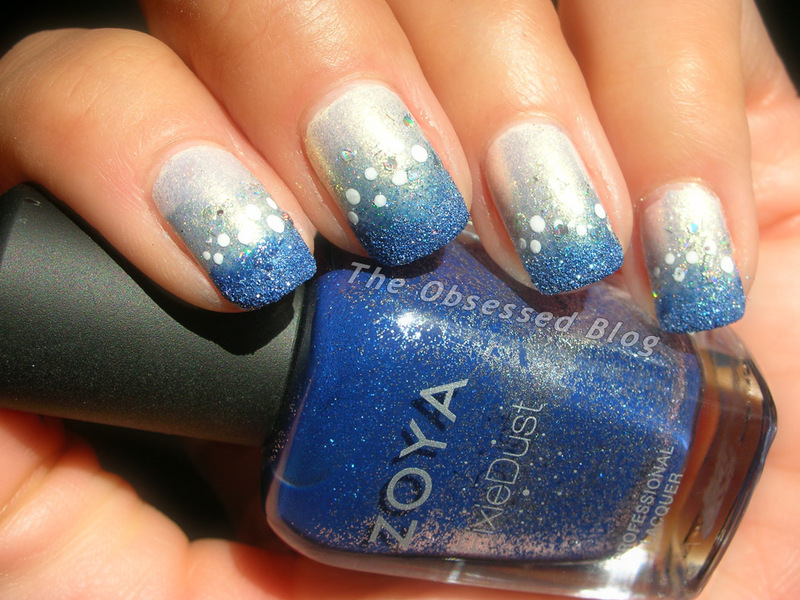 I love the sparkle and texture of Zoya’s Pixie Dust Sunshine, and thought the blue was a beautiful contrast to the white mani. Finally, OPI’s Which is Witch contains holographic glitter in a clear base, making it the perfect finishing touch for a “snow” themed manicure! If you like my nail art, would you vote for me on the Nail Polish Canada challenge page? Feel free to also register and participate here!